Make your own homemade soups and smoothies the quick and easy way. At Mytopia, we bring you an impressive collection of high quality soup makers and blenders built to cater to your very own taste. 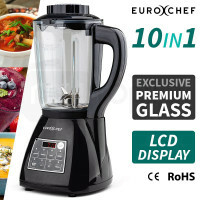 Euro-Chef Glass Soup Makers and PolyCool Commercial Blenders are the perfect appliances for you to achieve the perfect soups and smoothies. Forget about spending half your weekend cooking and washing up. 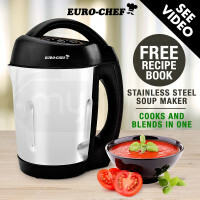 The Euro-Chef Soup Makers and PolyCool Commercial Blenders are made to help you whip up homemade soups and meal substitutes with minimal fuss. 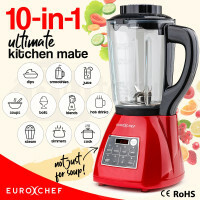 Euro-Chef Soup Makers are packed with great features like smooth or chunky soup settings, extra-large capacity jugs to serve the entire family, and they can also be used as a blender for smoothies and cocktails. 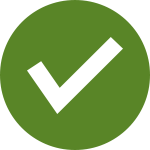 They also come with an overfill sensor with audible alarm, removable lid and power cord with an overall compact design. 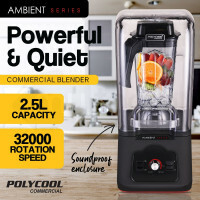 PolyCool Commercial Blenders have equally fantastic features such as commercial grade motors for ample power, 10-speed settings for precise control and child-proof suction lock lids for preventing spillages. They also have non-slip rubber feet, family-sized capacity jugs and tampers to help process thick mixtures and incorporate ingredients. Mytopia also sells other great kitchen appliances, offering a range of top-quality products such as Air Fryers, Deep Fryers, Soup Makers & Blenders, Meat Grinders & Slicers, Slow Cookers, Popcorn Machines, Food Dehydrators, Ice Makers, Food Waste Disposer, and so much more. 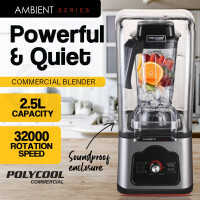 Order your Euro-Chef Soup Maker and PolyCool Commercial Blender today and turn soup and smoothie making into your cup-of-tea!